Second Chances was founded in 2009 and is located on 23 acres just south of Louisville, in Mt Washington and serves the surrounding counties. The entire state of Kentucky and Southern Indiana utilizes Second Chances for specialized bat rehabilitation. Our animals are cared for until they are ready to be released back into their natural environment. They may start off in an incubator being fed around the clock with lots of love and attention and graduate to a large pre release enclosure with minimal contact. All pre release enclosures are designed to simulate their individual habitat. These animals are taught survival skills they will need to be successful in the wild. The animals are released in protected areas with a food and water source. Prior to release, all animals are dewormed and fully vaccinated which promotes healthier populations in the wild. This also decreases the risk of pets and humans contracting wildlife diseases. Second Chances specializes in bats and skunks but accepts other mammal species. Bats are a very important species that is cared for at Second Chances. Bats are a keystone species to our environment and without them, our entire ecosystem would change…for the worse. The agricultural impact of bats is amazing. Bats save farmers billions of dollars each year! With the previlence of white nose syndrome, rehabilitators play a crucial role of this species’ survival and therefore, our ecosystem. Brigette Brouillard is the founder of Second Chances and is a licensed Wildlife Rehabilitator with the Kentucky Department of Fish and Wildlife and Federal Fish and Wildlife. Recently, every volunteer obtained their state permit as well! Second Chances is also licensed by the USDA. Brigette has over 20 years teaching experience in the private school system. She serves as a volunteer educator at The Louisville Zoo and is a member of the Southeastern Bat Diversity Network and Kentucky Bat Working Group. With attention to detail, the top-notch care we offer our patients, and a passionate message delivered in our education programs, we have earned an excellent reputation. In fact, National Geographic asked Second Chances to be part of their reality show called Bandit Patrol. Season 2 and Season 3 Bandit Patrol reruns air currently. Bandit Patrol is their number 2 rated show. While the show basis is about wildlife rehabilitation, Center Director, Brigette, takes every opportunity to educate the public during her filming. Brigette feels that it is important to understand our wildlife so we may help protect it and co exist with it. Educating is the key to do just that. In 2010, she was awarded the Kentucky Conservation Teacher of the Year. Second Chances Wildlife Center is the 2018 Center for Nonprofit Excellence (CNPE) Pyramid Award winner for the Art of Governance. 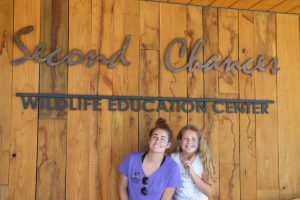 Please call 502-888-5470 or e-mail brigette@secondchanceswildlife.org with a wildlife emergency or to schedule an education program.